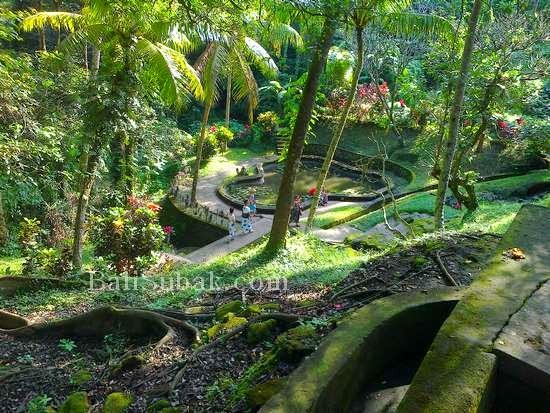 Goa Gajah, or Elephant Cave in English, is a tourist attraction in Bali which is located in Gianyar regency. This place is quite famous among foreign tourists. 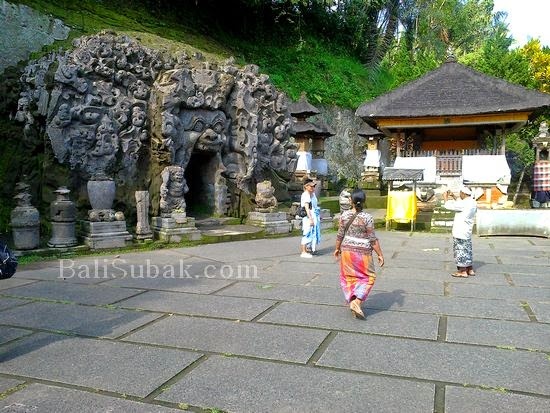 Because almost all the tourists who visit and vacation in Bali, certainly never visited Goa Gajah. 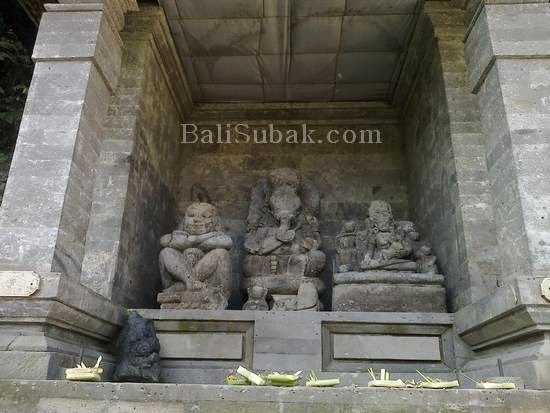 Attractions in Bali, located in Gianyar regency, precisely on Jalan Raya Goa Gajah. 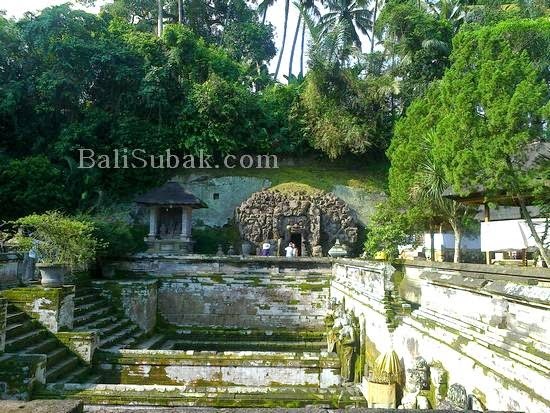 Goa Gajah is an artificial cave that serves as a place of worship. 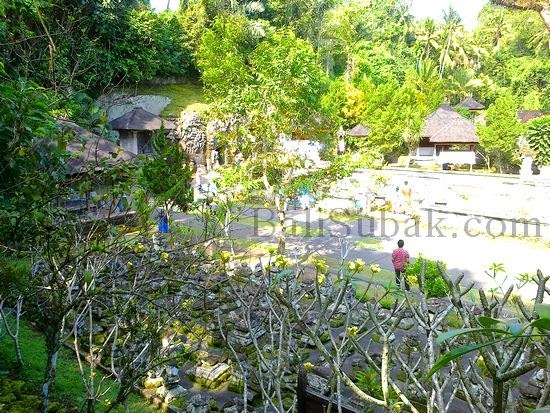 The cave is located in the village of Bedulu, Blahbatuh districts, Gianyar, Bali. From the parking area lot to the cave, visitors must go through the stairs. 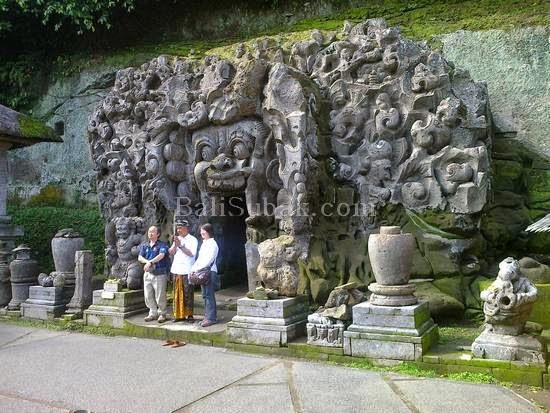 So if you are an old, have problems in the joints in the foot, you should not visit Goa Gajah / Elephant Cave. 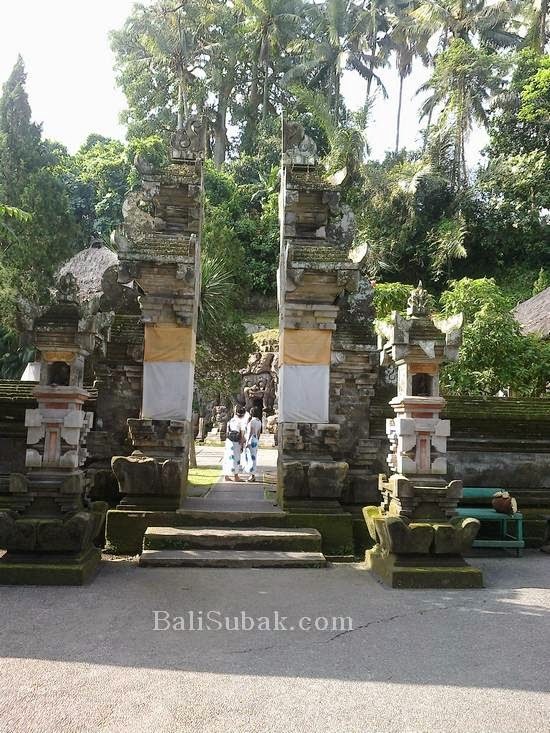 Because Goa Gajah is under the hill, so visitors must go through the steps on the way to the temple area, and had to climb on the way to the parking area. Make sure you are physically strong enough, because this is a historical tourist spot, also including natural attractions. After going through the stairs, we are faced with the arrangement of the temple-shaped stones that were placed in the west area of the cave. 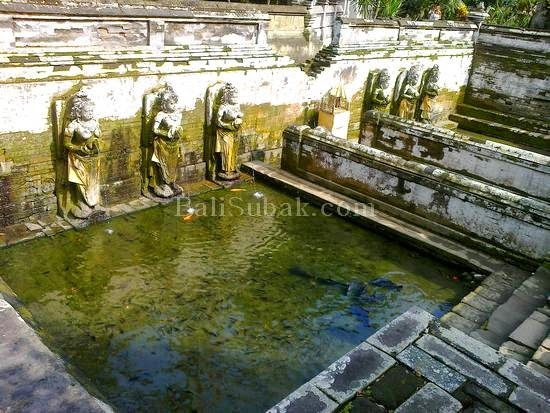 These temples are the remains of the ruins that have been found and saved, as evidence of the historical heritage that must be maintained properly. 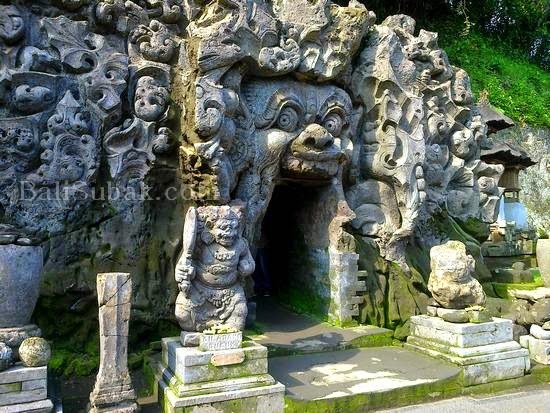 Goa Gajah or Elephant Cave is a cave created by ancient Balinese people to place imprisoned. This place is also created as a place of religious knowledge sailed. It was known as in the cave there is a statue to worship, as well as in front of the cave there are two pools with six female statues spouting water. 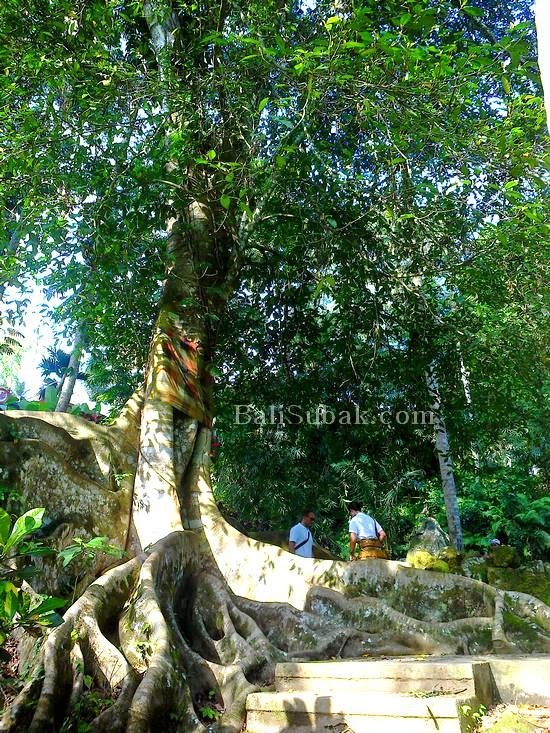 There is a large tree that was sacred in the area of Goa Gajah / Elephant Cave. Just like in other places in the temple in Bali, such as in temples, historical places, and places sanctified by the Balinese, must have a big tree. Usually it is a banyan tree or trees billowing. 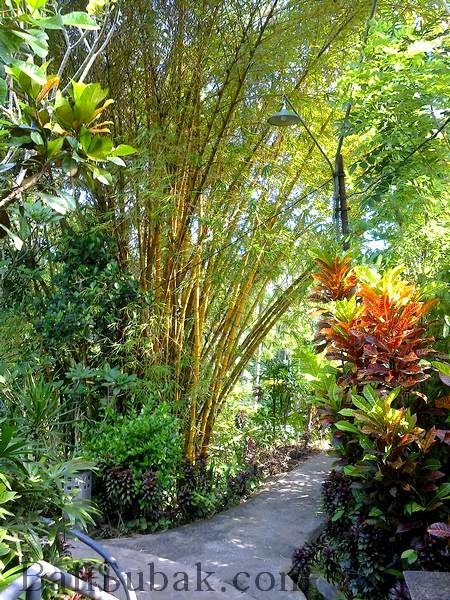 Balinese people believe ancestral spirits, the holy spirit, and supernatural beings living large tree. 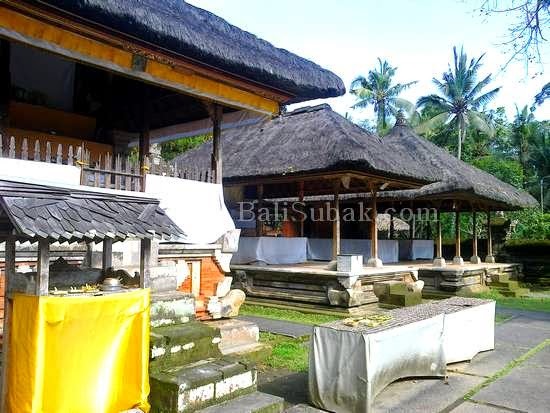 Goa Gajah area in order to avoid interference from supernatural beings, then in that place there must be a large tree as their residence. So that they do not interfere with humans around it. 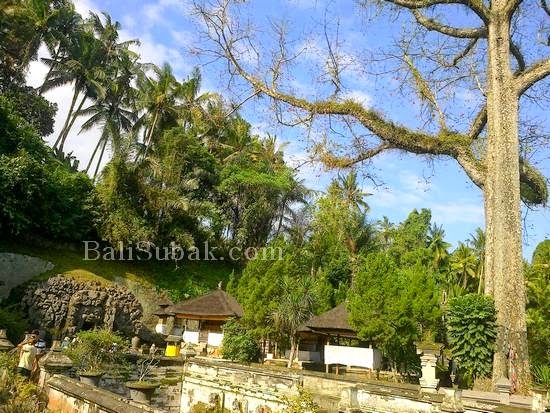 Also in the area of Goa Gajah, and the tree was very purified. 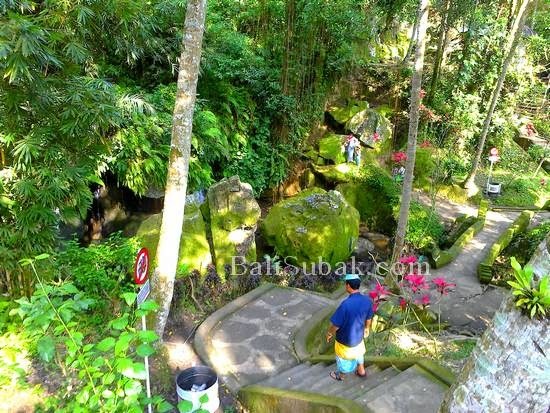 Area of Goa Gajah (Elephant Cave) is perfect for a relaxing place. 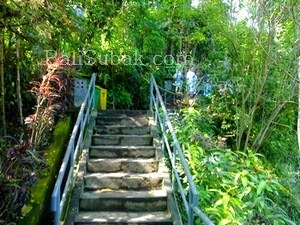 This area is very fresh air, quiet, and comfortable. 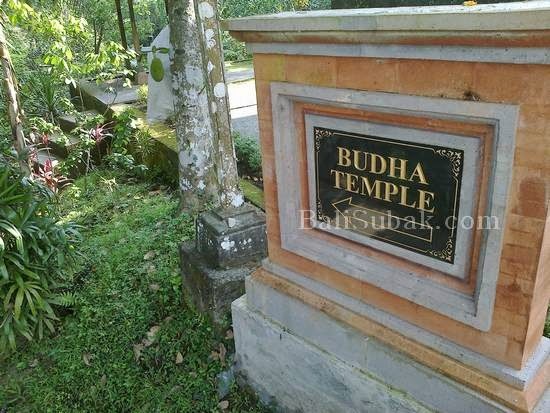 The most comfortable place in the area of Goa Gajah is a Budha Temple area. 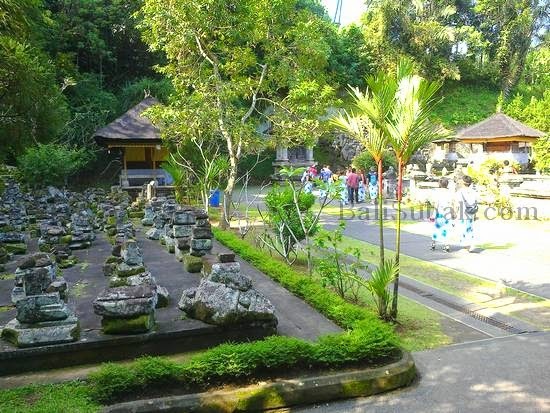 Budha temple on the river, under the Goa Gajah area. Budha Temple area filled with trees, very shady and cool. To get to the Budha Temple, we had to go down to the bottom of the stairs. 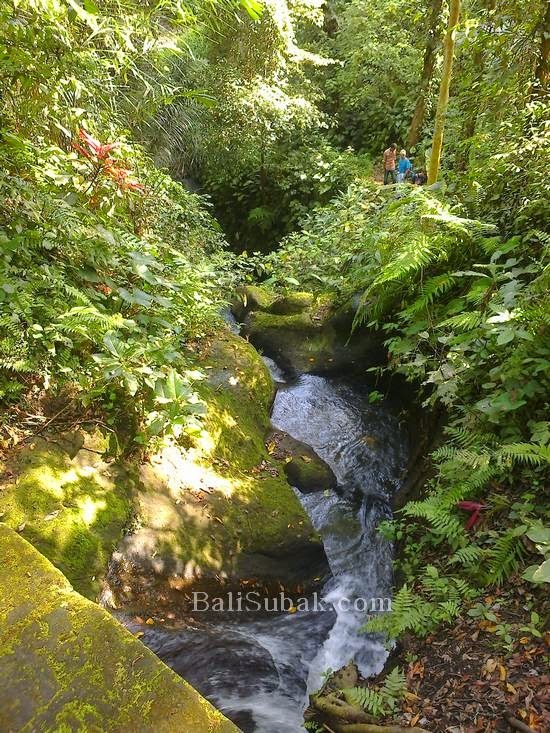 When arriving in the area Budha Temple in Goa Gajah, we can enjoy the sound of a waterfall in the river. The water is very clear. There is a ruined temple that had been destroyed. To cross this river there is a small bridge. 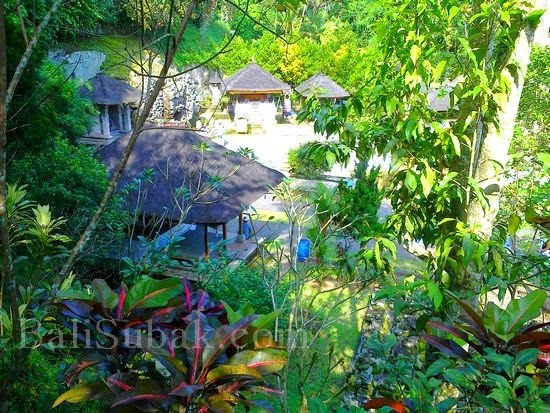 In this area we can sit back and enjoy the fresh air around. At the Budha Temple area, a large tree with a unique root and interesting. 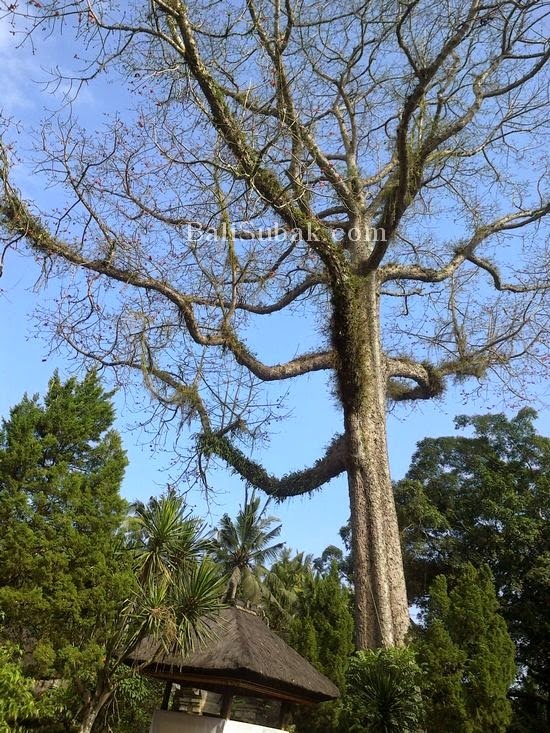 This tree is quite popular among foreign tourists. Under this tree you can sit back on a very large root. A time to yourself to take a photo in under the tree. Budha Temple area as a park in the forest. Park like in the children's fairy tale. 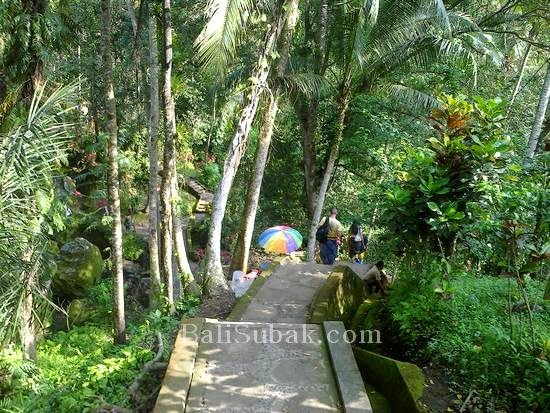 So the attraction of Goa Gajah is a natural park attraction that can be used for calming place away from city life. The park is very artistic with large stones and large plants. River with flowing water, the sound of water flowing is very soothing the soul. 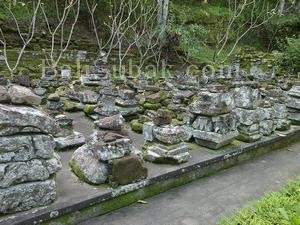 The structure of the soil and rocks in the area Budha Temple in Goa Gajah very artistic. In between there are many stone water flow through the narrow gap between the rocks. This water provides attractive scenery for visitors. In the west a large tree, there is a pond with lotus plants in the middle. In the pond you can sit relaxed for some time to just rest for a moment. 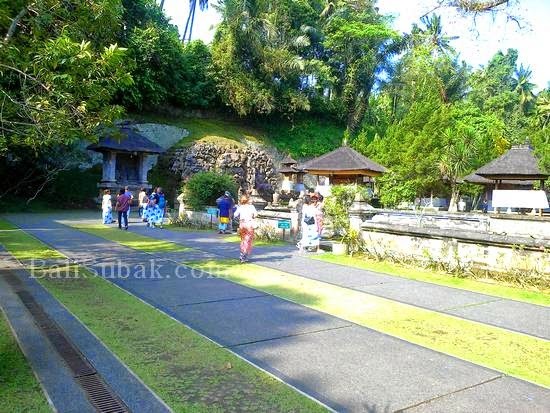 Goa Gajah is a great place to relax with family. 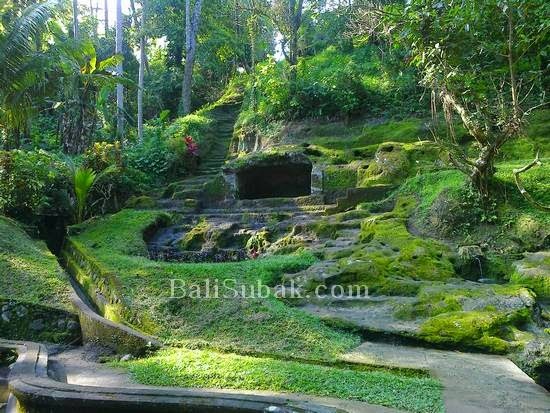 After a walk and enjoy the whole area of Goa Gajah / Elephant Cave, we can sit around and relax with the family in the hall that is in the area. 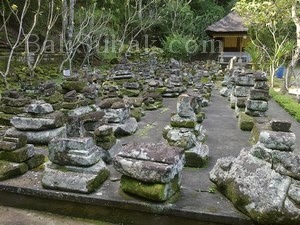 This hall is often used by people for ceremonial activities. This hall is also often used for the rest of the tourists who are tired of the area surrounding the Elephant Cave. In this hall we can sit while you listen to music from bamboo which is derived from the loudspeakers.